With everything from standings to fantasy closers receiving its own rankings before the preseason, we here at fb/cu couldn’t let the season get too far underway without creating a ranking that combines our two favorite pastimes; baseball and politics. Every season, I eagerly await the time when baseball decides to incorporate politicians. Whether it be a first pitch or the Congressional Baseball Game, nothing is as comfortable as the edge of my seat. At some point during the summer, the President will stroll from the dugout to the mound to make the first pitch. While the President is probably just doing it for PR, I can’t help rooting for the man leading the country to demonstrate his power on the mound. Regardless of party, I want the President to succeed. For America. Politicians Can Play Baseball Too! That happens to varying success. And as a result, I ranked the five best first-pitch Presidents. 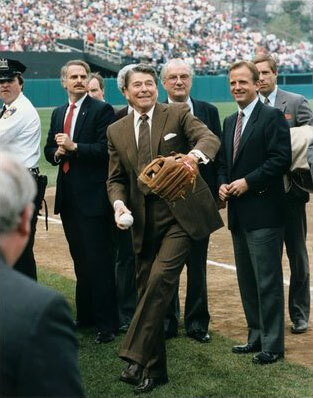 Disclaimer: Clinton was the first president to throw out the first pitch from the mound. Before this, most presidents threw from the stands or the base of the pitchers mound. I only included President’s that made throws from the field. 5. Barack Obama (L) – The President is known for his basketball skills, but his baseball skills remain little league at best. When your watching the video, you know its going to be bad when he struggles with his glove. And his form looks fresh out of the early 1900’s, slight pre-windup windmill arms and tons of body movement. Then he makes the pitch, missing the batters box by feet. It’s hard to justify him even making this list, but he squeaks in because, well, he’s the President. 4. Ronald Reagan (R) – Ronald Reagan was from Illinois and a self-professed lifelong Cubs fan. What remains little known is that he worked for WHO radio as a play by play announcer for the Cubs. His knowledge of baseball translated somewhat to his baseball abilities. But his form remains suspect from time to time. 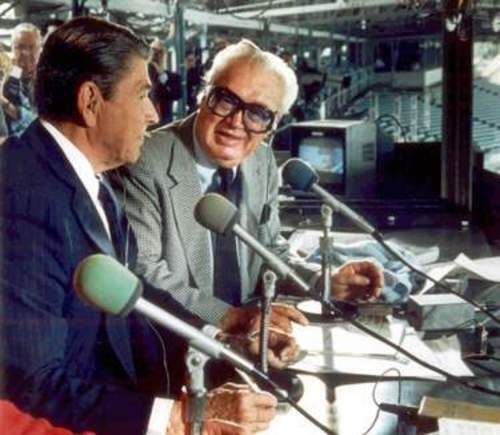 Ultimately, it seems that Reagan would be a better Harry Carey than a Greg Maddux. 3. Bill Clinton (L) – Clinton took the mound in Baltimore in 1996. After tons of practice both before the game and during warm-ups in the bullpen, Clinton stepped to the rubber. Although he would later admit his nerves, it doesn’t seem to come out in his pitch. The practice (or something else) worked as Clinton makes the first pitch look relaxed and easy. While he is no power pitcher, he accuracy is on point as he delivers a strike. 2. George H.W. Bush (L) – Even though there is little video of Bush Sr. thawing out the first pitch, the scouting on him alone warrants a number two ranking. Bush Sr. was captain of his high school baseball team, where he played first base. 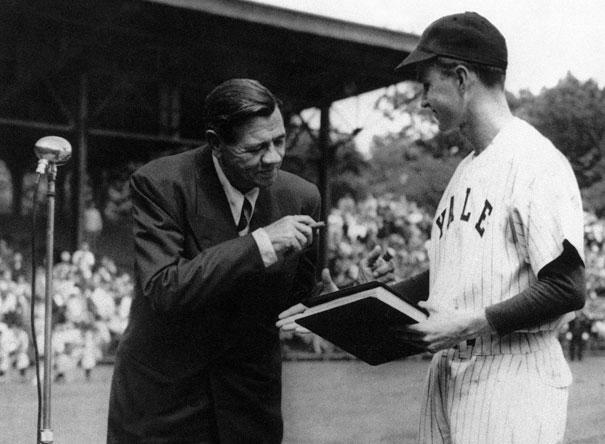 He later attended Yale, where he was also appointed captain and played in the first two College World Series. Although he decided to hang up his jersey after his schooling, he didn’t do so before meeting Babe Ruth. No other President experienced this amount of baseball conditioning, and when combined with his left-handed abilities, we easily give Bush Sr. the #2 position on our countdown. 1. George W. Bush (R) – If there was a Cy Young award to be given out to Commander’s in Chief, it would go to Bush Jr. He earned that award with one pitch on October 30, 2001. A little over a month after 9/11, Bush Jr. decided to head to Yankee Stadium to make the first pitch. In a city rich with history still looking for comfort, the President takes the field to a standing ovation in an FDNY jacket, camera crews lining up down the base paths. Reaching the mound, he turns to give a couple Presidential waves to the thousands of fans in attendance, giving little notice to the pinstripes stationed behind the plate. His face is stoic, no pre-celebratory smiles, and before you know it, he’s in the stretch. His form is tight, and he releases a perfect strike. The decibels spike because the President just put the nation on his back! No other first pitch has meant as much to the country as this first pitch, and George W. Bush pitched a perfect strike. And that concludes our Presidential rankings. We’ll see you again in 2016!